Additive Axiom: If a = b and c = d then a + c = b + d. If two quantities are equal and an equal amount is added to each, they are still equal. 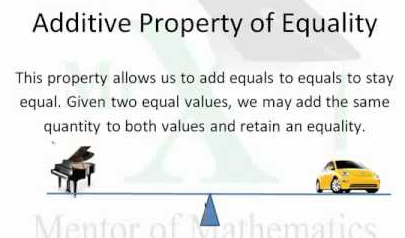 By using the additive property of equality and adding 2 to both sides of the equation, we are able to find the value of x.
b) Addition is commutative. For any a, b ∈ Z, a + b = b + a.
c) Addition is associative. For any a, b, c ∈ Z, (a + b) + c = a + (b + c). d) There is a zero element 0 ∈ Z, satisfying 0 + a = a = a + 0 for any a ∈ e) For any a ∈ Z, there exists an additive inverse −a ∈ Z satisfying a + (−a) = 0 = (−a) + a. Definition: Subtraction in Z is defined by a − b = a + (−b) for a, b ∈ Z. The field axioms are generally written in additive pairs. How to find the Area of a Square?